"The most important thing that you can do to maintain good physical and mental health and to assure yourself of equal opportunity in the future is to stay in school and get an education." Host a TEEN HEALTH WEEK℠ event! Established in 2016 as a joint program of the Center for Education of the College of Physicians of Philadelphia, Real Talk with Dr. Offutt, and the Pennsylvania Department of Public Health, TEEN HEALTH WEEK℠ is a global initiative to raise awareness of the unique health issues facing teens all over the world. 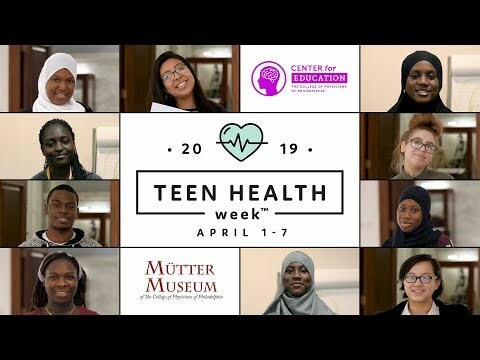 Through a wide variety of local, state, national, and international programs and activities, TEEN HEALTH WEEK ℠ encourages teens to take charge of their physical and mental health to facilitate healthy habits they will carry with them throughout their lives. What originally started in Pennsylvania as a statewide health initiative expanded to a global program, with participating events and activities in 37 countries on 6 continents! Mark your calendar for our annual TEEN HEALTH WEEK ℠ celebration. This FREE event brings together local teen health organizations and experts who will inform you about ways to stay healthy and foster healthy habits that will benefit you for years to come! This year's festivities have an exciting twist: register you and your friends in a team to compete in teen health challenges. Lucky conestants will take on the ultimate TEEN HEALTH WEEK ℠ challenge: The Gauntlet! Do you have what it takes to be a true Teen Health champion? Show your support for TEEN HEALTH WEEK ℠. Learn about our 2019 themes. Most important: free food and fabulous prizes. articles, see our THW in the News page. green is the color of TEEN HEALTH WEEK℠. Want to get involved in TEEN HEALTH WEEK℠? Follow TEEN HEALTH WEEK ℠ (@teenhealthweek) on Twitter and Instagram for information on teen health related issues and events! Wear your support for TEEN HEALTH WEEK℠! Get your official TEEN HEALTH WEEK℠ 2019 T-Shirt! Become a TEEN HEALTH WEEK℠ Sponsor!